A postal system is a system wherein written documents typically enclosed in envelopes, and also small packages containing other matter, are delivered to destinations around the world. Anything sent through the postal system is called mail or post. In principle, a postal service can be private or public. 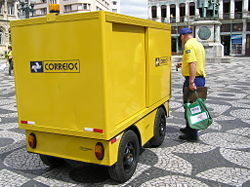 Governments often place restrictions on private postal delivery systems. Since the mid-nineteenth century, national postal systems have generally been established as government monopolies with a fee on the article prepaid, often in the form of adhesive stamps. In general, government monopolies only extend parcel (non-mail) delivery to courier services, which provide express delivery. Postal systems often have functions other than sending letters. In some countries, the postal system also has some authority over telephone and telegraph systems. In others, postal systems allow for savings accounts and handling applications for passports. The evolution of the postal system to the collection of national organizations that work together internationally, coordinated by the Universal Postal Union, allowing the transfer of printed and other materials around the world is a tremendous achievement. Although the postal system may appear to be outdated when compared with the more modern technologies such as the telephone, fax, and internet, it still has an advantage through its ability to send written documents as well as other items to any location, no matter how remote and lacking in modern technology. Such an interconnected set of systems, operating relatively smoothly despite the conflicts and barriers that have existed both within and between nations, represents a significant step toward the unification of all people as one human family, able to communicate and send all kinds of materials efficiently. Internal distribution of Mail (Thai Post). 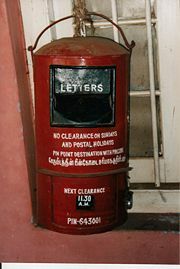 A post box in India. The postal system allows people to send letters or packages nationally or internationally. For the most part, they are run by the government and paid for through taxes and some federal funding. The word "mail" comes from the Medieval English word male, which was the term used to describe a traveling bag or pack. The French have a similar word, malle for a trunk or large box. In the 1600s the word mail began to appear as a reference for a bag that contained letters: "bag full of letter" (1654). Over the next hundred years the word mail began to be applied strictly to the letters themselves, and the sack as the "mailbag." In the nineteenth century the British usually referred to "mail" as being letters that were being sent abroad (on a ship), and "post"' as letters that were for localized delivery. The term "e-mail" (short for "electronic mail") first appeared in 1982. The term "snail-mail" is a retronym that originated in 1983 to distinguish it from the quicker e-mail. Communication by written documents carried by an intermediary from one person or place to another almost certainly dates back nearly to the invention of writing. However, development of formal postal systems occurred much later. The first documented use of an organized courier service for the diffusion of written documents is in Ancient Egypt, where Pharaohs used couriers for the diffusion of their decrees in the territory of the State (2400 B.C.E.). This practice almost certainly has roots in the much older practice of oral messaging and may have been built on a pre-existing infrastructure. The first credible claim for the development of a real postal system comes from Persia (present day Iran) but the point of invention remains in question. The best documented claim (Xenophon) attributes the invention to the Persian King Cyrus the Great (550 B.C.E. ), while other writers credit his successor Darius I of Persia (521 B.C.E.). Other sources claim much earlier dates for an Assyrian postal system, with credit given to Hammurabi (1700 B.C.E.) and Sargon II (722 B.C.E.). Mail may not have been the primary mission of this postal service, however. The role of the system as an intelligence gathering apparatus is well documented, and the service was (later) called angariae, a term that in time turned to indicate a tax system. The Hebrew Bible (Esther, VIII) makes mention of this system: Ahasuerus, king of Medes, used couriers for communicating his decisions. The next credible claimant to the title of first postal system is China. Claims concerning the origins of this mail system also conflict somewhat, but it is clear that an organized postal infrastructure was put in place during the Qin Dynasty (221 B.C.E.–207 B.C.E.) and was substantially expanded during the subsequent Han Dynasty. The first well documented postal service in Europe is that of Rome. Organized at the time of Augustus Caesar (62 B.C.E.–AD 14), it may also be the first true mail service. The service was called cursus publicus and was provided with light carriages called rhedæ with fast horses. Additionally, there was another slower service equipped with two-wheeled carts (birolæ) pulled by oxen. This service was reserved for government correspondence. Another service for citizens was later added. By the name of the stations in which mail was distributed and messengers' routes crossed, derives the Latin name of mail, posta (originally posata or pausata, "place of rest") because in these stations messengers used to rest during their voyages. The communications revolution of the early modern period was the result of the first reliable infrastructure of communication introduced at the beginning of the sixteenth century in central Europe. Postal systems were basically systems of portioning the space to create reliable channels of communication. Many religious orders had a private mail service, notably the Cistercians connected more than 6,000 abbeys, monasteries, and churches. The best organization however was created by Teutonic Knights. The newly instituted universities too had their private services, starting from Bologna in 1158. In 1505, Holy Roman Emperor Maximilian I established a postal system in the Empire, appointing Franz von Thurn und Taxis to run it. The Thurn and Taxis family, then known as Tassis, had operated postal services between Italian city states from 1290 onwards. Following the abolition of the Empire in 1806, the Thurn and Taxis postal system continued as a private organization, continuing to exist into the postage stamp era before finally being absorbed into the postal system of the new German Empire after 1871. It was around this time nationalization and centralization of most postal systems took place. 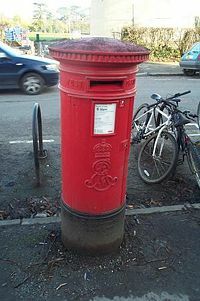 In colonial times, post offices were established to bring mail back and forth between the American colonies to England. 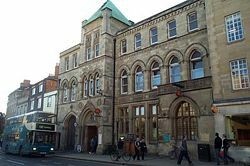 They differed from modern post offices because they were usually a part of local pubs and taverns, places where people generally frequent. Following this, a postal route was established between New York City and Boston. This was the first route established between the colonies, and today is known as U.S. Route 1. A centralized postal system came in 1693, when Thomas Neale received a grant from Britain. He appointed the governor of New Jersey, Alexander Hamilton, his deputy postmaster general. The position was succeeded by Hamilton's son, and in 1737, by Benjamin Franklin, who would improve the postal system in many ways. He improved old routes and laid newer, shorter routes, laid down new milestones on the route, and had mail traveling overnight between Philadelphia and New York. 1760 saw a surplus for the postal service in the colonies, a first for the organization. Following the American Revolutionary War, the United States established a postal system under the Constitution in 1789. George Washington appointed Samuel Osgood as the first postmaster general of the United States on September 26, 1789. Different acts and addenda in the following decade improved upon the duties of the postmaster and the postal system. Philadelphia was home to the postal headquarters until 1800, when it moved to Washington D.C. In 1872, the post office was established as an executive department. Many countries use their postal systems, along with the traditional exchanges of letters, for new services that have little to do with original forms of postal systems. Post offices are set up in areas that may see low traffic in order to make a complete system. With this, a banking service is brought with the post office into areas that may not see many banks. Various government benefits can be cashed through post offices, and some countries have post offices collect taxes. Different African postal services help distribute different vaccinations or medicines to those in need. Modern mail is organized by national and privatized services, which are reciprocally interconnected by international regulations, organizations, and international agreements. Paper letters and parcels can be sent to almost any country in the world relatively easily and cheaply. The Internet has made the process of sending letter-like messages nearly instantaneous, and in many cases and situations correspondents use electronic mail where previously they would have used letters, although the volume of paper mail continues to increase. Some countries have organized their mail services as public limited liability corporations without a legal monopoly. Nevertheless, mail is economically a natural monopoly, and so only few competitors surface, and even they offer a more specialized service. 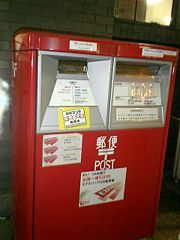 The world-wide postal system comprising the individual national postal systems of the world's self-governing states is coordinated by the Universal Postal Union, which among other things sets international postage rates, defines standards for postage stamps and operates the system of International Reply Coupons. In most countries a system of codes has been created (called "ZIP Codes" in the United States, "postcodes in the United Kingdom and Australia, and "postal codes" in most other countries), in order to facilitate the automation of operations. This also includes placing additional marks on the address portion of the letter or mailed object, called "bar coding." Bar coding of mail for delivery is usually expressed either by a series of vertical bars, usually called POSTNET coding, or a block of dots as a two-dimensional barcode. The "block of dots" method allows for the encoding of proof of payment of postage, exact routing for delivery, and other features. The ordinary mail service was improved in the twentieth century with the use of airplanes for a quicker delivery (air mail). The first scheduled airmail service took place between the London suburbs of Hendon and Windsor on 9 September 1911. Some methods of airmail proved ineffective, however, including the United States Postal Service's experiment with rocket mail. Worldwide the most common method of prepaying postage is by buying an adhesive postage stamp to be applied to the envelope before mailing; a much less common method is to use a postage-prepaid envelope. Franking is a method of creating postage-prepaid envelopes under license using a special machine. They are used by companies with large mail programs such as banks and direct mail companies. In 1998, the U.S. 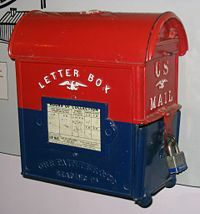 Postal Service authorized the first tests of a secure system of sending digital franks via the Internet to be printed out on a printer, obviating the necessity to license a dedicated franking machine and allowing companies with smaller mail programs to make use of the option; this was later expanded to test the use of personalized postage. The service provided by the U.S. Postal Service in 2003 allows the franks to be printed out on special adhesive-backed labels. In 2004 the Royal Mail in the United Kingdom introduced its "SmartStamp" Internet-based system, allowing printing on ordinary adhesive labels or envelopes. When the pre-paid envelope or package is accepted into the mail by an agent of the postal service, the agent usually indicates by means of a cancellation that it is no longer valid for pre-payment of postage. The exceptions are for stamps that are pre-canceled and thus do not require cancellation and for, in most cases, metered mail. Documents cannot be read by anyone other than the receiver. However, exceptions do exist, such as postcards, which can be read by the mail carrier for the purpose of identifying the sender and receiver. The privacy of correspondence was argued for and often ignored in European countries since the sixteenth century, and is alluded to in the Universal Declaration of Human Rights According on the laws in the relevant jurisdiction, correspondence may be openly or covertly opened or the contents determined via some other method, by the police or other authorities in some cases relating to their relevance to an alleged or suspected criminal conspiracy, although black chambers (largely in the past, though there is apparently some continuance of their use today) opened and open letters extra legally). Control of private citizens' mail is called censorship and concerns social, political, and legal aspects of civil rights. Even though often illegal, there have been cases over the centuries of governments illegally opening and copying or photographing the contents of private mail. While in most cases this censorship is exceptional, in the military, censorship of mail is routine and almost universally applied, particularly with respect to soldiers near a battlefront. 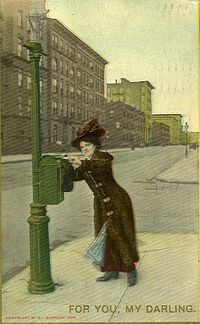 The use of mail is subject to common rules and a particular etiquette. Modern alternatives such as the telegraph, telephone, and e-mail have reduced the attractiveness of paper mail for many applications. Sometimes these more modern alternatives can be easier to use. 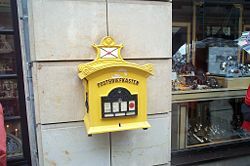 Modern alternatives can be better than paper mail because vandalism can occur with mailboxes (although it can also be argued that paper mail does not allow for computer viruses). Also, hazards exist for mail carriers, though some are the resident's fault (such as dog bites). Due to hazards or inconveniences postal carriers may refuse, officially or otherwise, to deliver mail to a particular address (for instance, if snow buildup obstructs the clear path to the door or mailbox). Postal mail is, however, still widely in use for business (due to the particular legal standing of signatures in some situations and in many jurisdictions, etiquette, or transmission of things that cannot be done by computer, as a particular texture, or, obviously, items in packages) and for some personal communication. For example, wedding invitations in Western countries are customarily sent by mail. Several countries, including Sweden (1993), New Zealand (1998 and 2003), and Argentina have opened up the postal services market to new entrants. In the case of New Zealand Post Limited, this included (from 2003) its right to be the sole New Zealand postal administration member of the Universal Postal Union, thus the ending of its monopoly on stamps bearing the name New Zealand. In modern times, beginning in the twentieth century, mail has found an evolution in vehicles using newer technologies to deliver the documents, especially through the telephone network; these new vehicles include telegram, telex, facsimile (fax), e-mail, and short message service (SMS). There have been methods which have combined mail and some of these newer methods, such as INTELPOST, which combined facsimile transmission with overnight delivery. These vehicles commonly use a mechanical or electro-mechanical standardized writing (typing) that on the one hand makes for more efficient communication, while on the other hand makes impossible characteristics and practices that traditionally were in conventional mail, such as calligraphy. With the advent of eBay and other online auction sites and online stores, postal services in industrialized nations have seen a major shift to item shipping. This has been seen as a relief to the system due to the lowered level of paper mail due to the accessibility of e-mail. While many things are sent through the mail, personal letters are often thought of first in reference to postal systems. Handwritten correspondence, while once a major means of communications between distant people, is now used less frequently due to the advent of more immediate means of communication, such as the telephone or e-mail. Traditional letters, however, are often considered to hearken back to a "simpler time" and are still used when someone wishes to be deliberate and thoughtful about his or her communication. Bills and invoices are often sent through the mail, such as regular billing correspondence from utility companies and other service providers. These letters often contain a self-addressed, envelope that allows the receiver to remit payment back to the company easily. While still very common, many people now opt to use online bill payment services, which eliminate the need to receive bills through the mail. Bulk mail is mail that is prepared for bulk mailing, often by presorting, and processing at reduced rates. It is often used in direct marketing and other commercial solicitations sent by advertisers, although it has other uses. The senders of these messages sometimes purchase lists of addresses (which are sometimes targeted towards certain demographics) and then send letters advertising their product or service to all recipients. Other times, commercial solicitations are sent by local companies advertising local products, like a restaurant delivery service advertising to their delivery area or a retail store sending their weekly advertising circular to a general area. Bulk mail is also often sent to companies' existing subscriber bases, advertising new products or services. There are a number of other things almost without any exception sent exclusively as letters through postal services, like wedding invitations and bank statements. Postal cards and postcards are small message cards which are sent by mail without an envelope. The distinction often, though not invariably and reliably, drawn between the two forms is that "postal cards" are issued by the postal authority or entity with the "postal indica" (or "stamp") preprinted on them, while postcards are privately issued and require affixing an adhesive stamp (though there have been some cases of a postal authority's issuing non-stamped postcards). Postcards are often printed today to promote tourism, with pictures of resorts, tourist attractions or humorous messages on the front and allowing for a short message from the sender to be written on the back. The postage required for postcards is generally less than postage required for standard letters. Packages are often sent through some postal services, usually requiring additional postage than an average letter or postcard. Many postal services have limits on what can and cannot be sent inside packages, usually placing limits or bans on perishable, hazardous, or flammable materials. Additionally, because of terrorism concerns, the U.S. Postal Service subjects their packages to various security tests, often scanning or x-raying packages for materials that might be found in mail bombs. Magazine subscriptions are also sent through postal services. Many magazines are simply placed in the mail normally (but in the U.S., they are printed with a special bar code that acts as pre-paid postage, but many are shipped in shrink-wrap to protect the loose contents of the magazine. 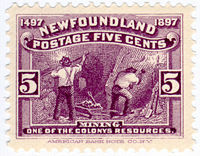 A postage stamp is evidence of pre-paying a fee for postal services. Usually a small paper rectangle that is attached to an envelope, the postage stamp signifies that the person sending the letter or package may have either fully, or perhaps partly, pre-paid for delivery. Postage stamps are the most popular way of paying for retail mail; alternatives include prepaid-postage envelopes and Postage meters. Postage stamps were first introduced in the United Kingdom in May 1840 as part of the postal reforms promoted by Rowland Hill. With its introduction the postage fee was now to be paid by the sender and not the recipient as heretofore, though sending mail prepaid was not a requirement. 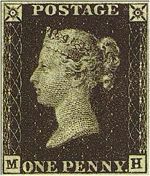 The first postage stamp, the Penny Black, first issued on the 1st of May for use from May 6, and two days later, the Two pence blue, with an engraving of the young Queen Victoria, were an immediate success though refinements, like perforations were instituted with later issues. Other countries followed suit by introducing their own postage stamps; the Canton of Zürich in Switzerland issued the Zurich 4 and 6 rappen; although the Penny Black could be used to send any letter weighing less than 15 grammes within the United Kingdom, the Swiss postage still calculated mail rates based on the distance traveled. Brazil issued the Bull's Eyes stamps in the 1843, using the same printer as that used for the Penny Black. The Brazilian government opted for an abstract design instead of an image of emperor Pedro II in order that his image would be not disfigured by the postmark. In 1845 some postmasters in the USA issued their own stamps, but the first officially issued stamps came in 1847, with the 5 and 10 cent stamps depicting Benjamin Franklin and George Washington. A few other countries issued stamps in the late 1840s, but many more, such as India, started in the 1850s and by the 1860s most countries of the world had issued postage stamps. Following the introduction of the postage stamp in the United Kingdom the number of letters mailed increased from 82 million in 1839 to 170 million in 1841. Stamps have been issued in other shapes besides the usual square or rectangle, including circular, triangular, and pentagonal. Sierra Leone and Tonga have issued self-adhesive stamps in the shape of fruit; Bhutan has issued a stamp with its national anthem on a playable record, and so forth. Stamps have also been made of materials other than paper, commonly embossed foil (sometimes of gold); Switzerland made a stamp partly out of lace and one out of wood; the United States produced one made of plastic, and the German Democratic Republic once issued a stamp made entirely of synthetic chemicals. In the Netherlands a stamp was issued made of silver foil. In the United States, the introduction of Information Based Indicia (IBI) technology has allowed newer ways to sell stamps. IBI is an encrypted 2-dimensional bar code that makes counterfeiting more difficult and easier to detect, offering value beyond postage. Unlike traditional postage meter indicia, each IBI is unique. The IBI contains security critical data elements as well as other information, such as point of origin and the sender. The IBI is human and machine-readable. Prior to IBI being introduced, postage vault devices were used on personal computers to allow postage stamps to be printed from one's computer. The postage vault device is a tamper resistant postal security device to disable postage equipment when tampered with. The postage vault can be also identified as the means to store (and keep track of) monetary funds in the postage vault. This is essentially prepaying for the right to print postage from your personal computer. The Internet is used to reset or replenish funds in the postage vault. The push towards using IBI technology aids the United States Postal Service in finding new venues to sell stamps. It also reduces the burden of maintaining the mechanical machines to sell stamps. The United States Postal Service still relies on co-signing stamps to retailers and banks (via automatic teller machines (ATMs). They must be the same size and thickness as currency in order to be dispensed by the ATM. Similarly, Royal Mail in the United Kingdom launched a "Print-your-own-postage" service allowing the general public to purchase IBI-style codes online, and print them onto address stickers or directly onto envelopes, in lieu of using First Class postage stamps. This was much remarked-upon in the press as the first time a consumer "stamp" has not featured an image of the reigning monarch. It joins the existing "Smart Stamp" subscription service, which performed the same function but which was aimed at business customers. Postage stamps are also object of a particular form of collecting, and in some cases, when demand greatly exceeds supply, their commercial value on this specific market may become enormously greater than face value. Stamp collecting is commonly known as philately, although strictly the latter term refers to the study of stamps. For some postal services the sale of stamps to collectors who will never use them is a significant source of revenue. This has been condoned by the collecting community for places such as Liechtenstein and Pitcairn Islands that have followed relatively conservative stamp issuing policies. Abuses of this policy, however, are generally condemned. Among the most notable abusers have been Nicholas F. Seebeck in the 1890s and the component states of the United Arab Emirates. ↑ The Quotations Page. Herodotus. Retrieved Janyar 17, 2018. ↑ Online Etymology Dictionary. Post. Retrieved January 17, 2018. ↑ 5.0 5.1 History of the United States Postal Systems ThoughtCo. Retrieved January 17, 2018. ↑ 6.0 6.1 David Kahn, Back When Spies Played by the Rules The New York Times, January 13, 2006. Retrieved July 12, 2007. ↑ 7.0 7.1 Donald Lehnus, Angels to Zeppelins: A Guide to the Persons, Objects, Topics, and Themes on United States Postage Stamps, 1847-1980. (Greenwood Press, 1982, ISBN 978-0313234750). Anderloni, Luisa and Roberto Ruozi (eds.). Modernisation and Privatisation of Postal Systems in Europe: New Opportunities in the Area of Financial Services. Springer, 2002. ISBN 978-3540427773. John, Richard. Spreading the News: The American Postal System from Franklin to Morse. Harvard University Press, 1998. ISBN 978-0674833425. Lehnus, Donald. Angels to Zeppelins: A Guide to the Persons, Objects, Topics, and Themes on United States Postage Stamps, 1847-1980. Greenwood Press, 1982. ISBN 978-0313234750. Olcheski, Bill. Beginning Stamp Collecting. New York, NY: Henry Z. Walck, Inc., 1976. ISBN 0809824299. Silverstein, Adam. Postal Systems in the Pre-Modern Islamic World. Cambridge University Press, 2007. ISBN 978-0521858687. History of the United States Postal Service ThoughtCo. This page was last modified on 17 January 2018, at 21:14.